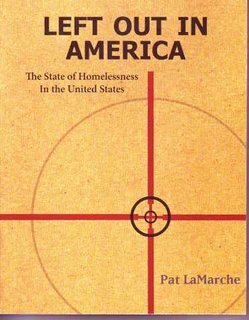 Pat LaMarche will be signing copies of her new book at Gulf of maine Books, Saturday, Dec. 16, 4 PM. I worked for two years as "poet in residence" at the Preble Street Resource Center in Portland, where Julie Johnson and I facilitated a weekly 3 hour poetry workshop for homeless and low income writers for two years. We didn't see many politicians there, and if we did it was usually either election time, or one of the holidays like christmas or thanksgiving, when they would come and serve a meal. You didn't really get the sense that they were there to listen, learn and make changes. Pat LaMarche, Maine broadcaster, journalist, and Green Party gubernatorial candidate ran, in 2004, for vice-president of the United States as the Green Party candidate. As part of this campaign she wanted to focus on real issues, economics, health care, and homelessness. She set up a two week tour across america, sleeping in homeless shelters or on the street, carrying her life in a bag. Some shelter operators were wary of politicians using them for photo ops, other cities, like New York, threatened to have her arrested if she tried to stay in one of their shelters. Along the way she met many Americans who are suffering, who have no safety net, who are out on the street for a variety of reasons (mental illness, disability, domestic abuse, financial troubles...) Instead of using them for photo ops, Pat listened to their stories, listened with her heart, and thought about ways in which this unnecessary suffering might be made a thing of the past. This new book recounts that trip, and allows the people she met on the way to speak in their own voices, or through Pat's heart. 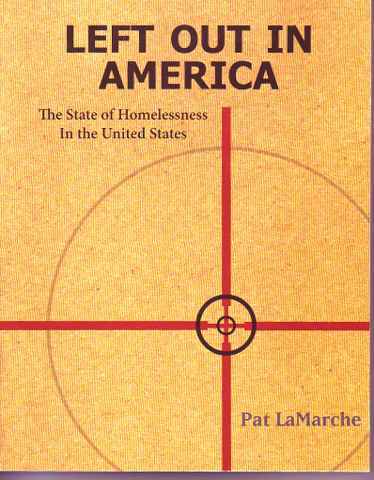 This is a book from the heart of America, with important messages, messages we need not only to listen to, but act upon. Pat LaMarche has a big heart, and she listens. I am sorry that she is not the governor. I am sorry that she is not the vice president. I am very glad to have this book.